Bag decorations are a brilliant way to jazz up that old handbag or individualize one you bought on the high street. 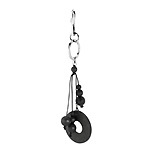 Arctic Fashion has two funky Scandinavian design handbag charms that are not available on the high street. Made from eco friendly Finnish wood, the Rumba and Kaisli wooden bag decorations by Aarikka are ideal for this purpose. Simply clip one to your bag to give it a whole new look. 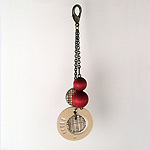 This fashionable, environmentally friendly design from Finland is available in cheery red or sophisticated black. The lightweight Rumba bag decoration is fun and funky. Choose from mixed brown or black to match either colour accessories.